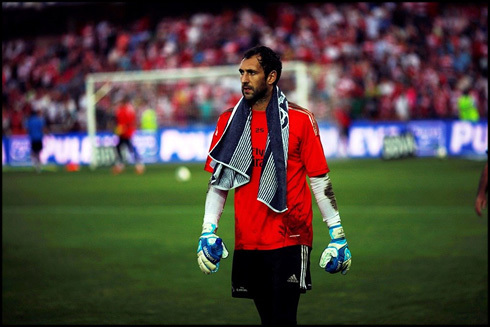 ﻿ Diego López: "It's difficult to put on words how good Ronaldo is"
27.09.2013 » Diego López: "It's difficult to put on words how good Ronaldo is"
In an interview granted to bwin, Diego López previewed this Saturday clash between Real Madrid and Atletico Madrid by sharing his personal view on the derby. The former Villarreal goalkeeper also lauded Cristiano Ronaldo qualities and admitted that the Portuguese forward is currently the most vital piece of Real Madrid's puzzle. 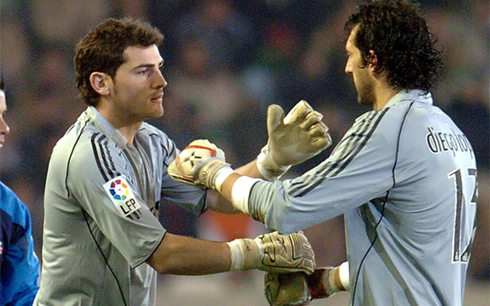 Who would imagine a year ago that Iker Casillas was to lose his untouchable status in Real Madrid? 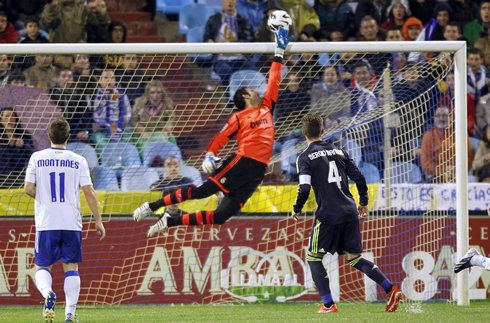 Diego López earned the Merengues starting spot with full merit and he quickly established himself as one of the best goalkeepers in the game. With a high voltage derby of Real Madrid vs Atletico Madrid scheduled for this Saturday, bwin picked the 31-year old giant to preview the match, as well as to give voice to his oppinion on Real Madrid's biggest strengths this season. 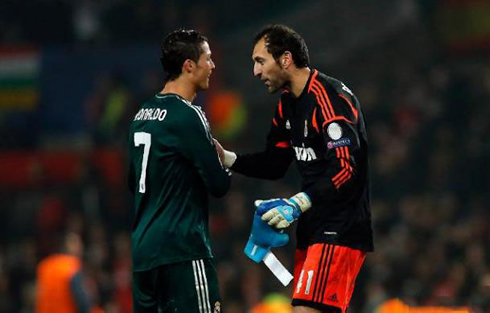 Diego López: "It's hard to describe a player as good as Cristiano Ronaldo. He's the best in the World and we are all extremely happy to have him with us not only now, but for the many years to come that he'll stay at the club. The news we've had about him having renewed his contract with Real Madrid were quite simply everything we could have wished for", started by stating the Paradela-born footballer. This weekend and more precisely this Saturday, Real Madrid hosts Atletico Madrid live at the Santiago Bernabéu, with the two teams set apart by only 2 points in La Liga standings. It's still early in the season, but another slip from the Merengues could actually represent a golden chance for Barcelona to increase the point gap between the two archrivals. Almeria vs Barcelona takes place 4 hours earlier than the Madrid derby and Tato Martino's men will watch the game on TV happily knowing that at least one of their rivals is going to drop points. Diego López: "Any game between Real Madrid and Atletico Madrid always burst out great rivalry feelings and for that reason, we're all eagerly waiting for the match to kickoff. These are the kind of games where you can see the true passion for the sport. It's a game where everyone gives all they have and don't have, in order to come out with the 3 points", anticipated the Real Madrid goalkeeper, who is expected to be on the line-up tomorrow night. López: "At this house, we know we have to win every single game and we cannot drop any more points, much less at our own stadium. All the games are special for me, but I do make an effort to keep my routines and to treat them all the same way. We'll be facing a highly dangerous side. Atletico Madrid are a very tight and united group and they also know how to play football very well. We'll need to try to exploit their flaws and simply take advantage on that. I obviously wish we can win the game, but more than that, I hope we can deliver a good show to our fans", concluded the Spanish international. This Saturday will be a strong day in terms of football matches across the whole Europe. Apart from the Madrid derby, we'll also have Barça visiting Almeria at 17:00 (GMT+1) and several exciting games in England, with the unmissable "André Villas Boas vs José Mourinho" first clash of the season, as Tottenham vs Chelsea open this Saturday matchday at 12:45 (GMT+1). Cristiano Ronaldo next game for Real Madrid will be for La Liga, this Saturday (September 28, 2013), against Atletico Madrid. You can watch Juventus live stream, Real Madrid vs Atletico Madrid live streaming, Almeria vs Barcelona live, Manchester United vs WBA and Tottenham vs Chelsea, all games provided from our soccer live section.